DUTCH SILENCE OVER BESA LINKS? – Alternate Comms. Dutch Ambassador to Macedonia silent over “links” to Albanian party Besa. The Netherlands Ambassador to Macedonia Mr Wouter Plomp has declined to comment over claims that his country has financed or assisted Albanian political party Besa. 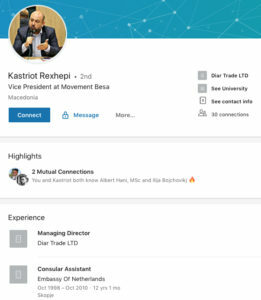 Besa leader Bilall Kasami was contacted for a comment and he too has not responded. 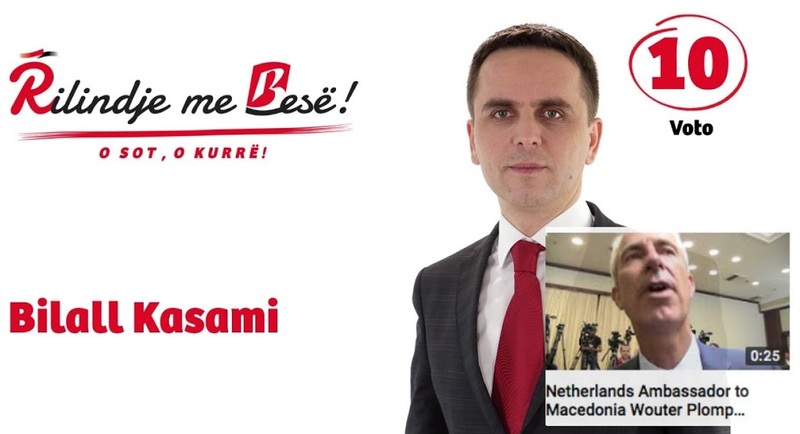 Besa is an ethnic Albanian political party, recently formed in Macedonia and a member of the current coalition govetrment led by Prime Minister Zoran Zaev. The controversial Culture Minister is Asaf Ademi from Besa. Besa has been portrayed as an Erdogan inspired Islamist party but Dutch diplomatic sources have told TEAM UZUNOV that this is simply a political smokescreen to hide Dutch and US influence. Besa is demanding that Albanian be made the second official language in Macedonia on par with Macedonian and embedded in the constitution despite language rights already guaranteed by 2001 Ohrid Framework Agreement. Both Greece and Bulgaria are EU and NATO members and have in effect blackmailed Macedonia unless it makes dramatic changes to its identity, something extraordinary in terms of demands. 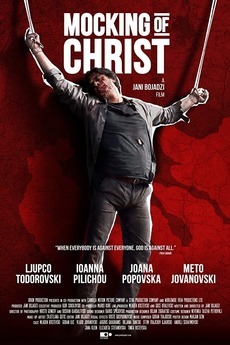 Macedonia’s Culture Minister Ademi, from Besa, sought to ban a Macedonian film by director Jani Bojadzi called The Mocking of Christ which has a scene depicting Albanian terrorists based on a real life event from the 2001 ethnic Albanian war in Macedonia. The ban was overturned in court but most cinemas, which are under state control or influence, have declined to show. So an unofficial ban and censorship is in place. A Dutch diplomat, who has asked not to be named and who has worked in most parts of the Balkans has told TEAM UZUNOV blog that the Netherland’s Embassy in Macedonia acts as a kind of grooming or “Swiss finishing school” for budding ethnic Albanian politicians. 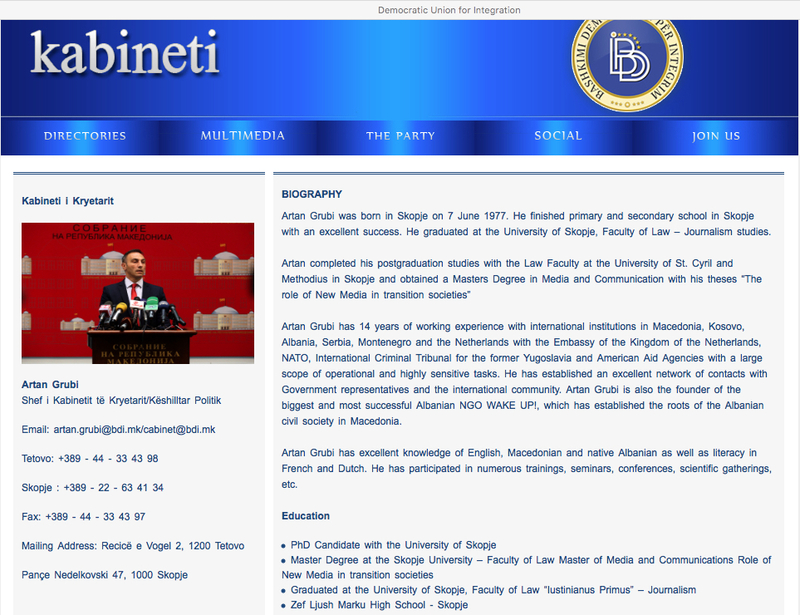 ARTAN GRUBI – began working for the Netherlands Embassy and branched out as a “civic activist” which in reality meant Albanian nationalist activist. He made a name for himself in violent clashes over the building of a possible Macedonian Orthodox Church in Skopje. He holds extremist views, labelling Macedonians as “Slavs” and advocating ethnic cleansing of Macedonians. Not surprisingly he was recruited by the main ethnic Albanian political party DUI led by ex terrorist turned politician Ali AHmeti who started the 2001 war in Macedonia ostensibly for a land grab rather than for human rights. Skopje criminal court on Tuesday handed down seven-month suspended sentences to participants in the clashes between ethnic Albanians, who were angry about the controversial building of a museum in the style of a church at the fortress, and Macedonians who said they came to defend the construction site. They were convicted of taking part in a mass brawl and obstructing officials, but will only face jail if they reoffend within two years. Eight people were injured in the violence in February 2011. It erupted amid fears raised by some Albanian Muslims that the church-like museum, which stands on the site of a demolished medieval church, would at some stage become an active Christian place of worship in an area of the city that they see as their own. The violence was organised on over social networks by the ethnic Macedonian group, which was mainly composed of football fans, and the ethnic Albanians who were mobilised by an NGO called Razbudi se (Wake Up). The leader of Razbudi se was Artan Grubi, who has since entered politics. He has been nominated by the Democratic Union for Integration, DUI, the ethnic Albanian party that’s the junior partner in Macedonia’s ruling coalition, as its candidate for mayor of Skopje in the upcoming local elections scheduled for March 24. The fortress clashes also provoked debates about the actions of deputy interior minister Xhevat Buci, an ethnic Albanian who was observed at the scene of the violence taking handcuffs off some of those arrested by the police. 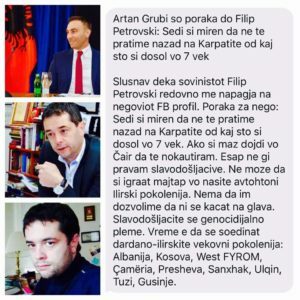 Grubi also advocates the ultra nationalist view that Albanians are “indigenous” and Macedonians should be deported back – ethnic cleansed – over the Carpathian Mountains – now in the Ukraine as alleged Slavs. That the Western backers of Grubi have deliberately turned a blind eye to his extremism and penchant for violence is alarming and indicates a hidden agenda. Within DUI’s ranks is ex Gostivar Mayor and former Macedonia Minister Nevzat Bejta who has built World War II Albanian Nazi collaborator statues in Macedonia. This is a touchy subject for Western backers, including the Dutch, of Albanian leaders. So much so that current Dutch Ambassador Wouter Plomp has nervously refused to comment on it. Dutch Ambassador Plomp’s refusal to comment on WWII Albanian Nazi collaborator statues. 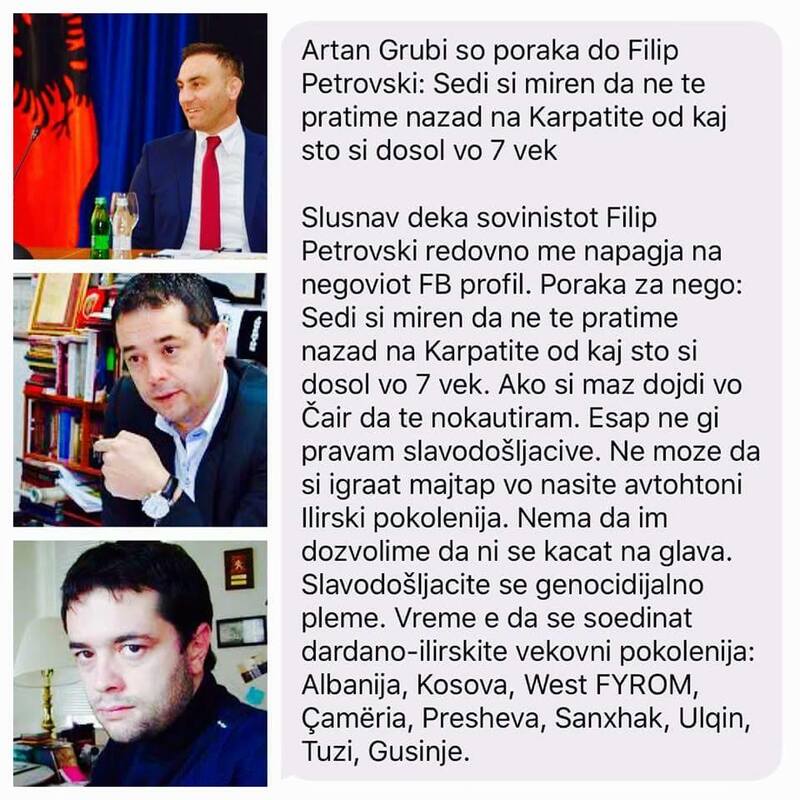 No doubt inspired by having Artan Grubi once working for the Netherlands Embassy and would raise questions about pandering if not promoting Albanian extremism in Macedonia by the Netherlands. KASTRIOT REXHEPI – Besa Vice President. Another protege of the Dutch Embassy is Kastriot Rexhepi who has advertised it loudly and predominately on social media. As mentioned above Besa has made a number of nationalist demands including language “rights” and seeking a ban on a Macedonian film which portrays a real life event – Albanian terrorists from the 2001 war in Macedonia. 1. Ambassador Plomp, does The Netherlands government or any Netherlands institutions or organisations either private or public finance the ethnic Albanian political party in Macedonia called BESA? 2. Ambassador Plomp, The Netherlands was a victim of Nazi occupation during WWII but has remained silent over the building of Albanian Nazi statues in Macedonia. Sir, will you be issuing an official statement condemning WWII Albanian Nazi collaborator statues built in Macedonia by Albanian politicians? 1. Dali Besa dobiva pomos od Ambasadata na Holandija vo Makedonija? 2. Dali Besa dobiva finansiski donacii (paricni) od Holandija – od drzavni institucii ili privatni NGO (ne vladini organizacii)? 3. Dali Besa kje pobara da se trgne spomenikot vo Simnica za Xhem Hasa, Albanski nacist i sorabotnik na Hitlerova Germanija vo vremeto na Vtorata Svetska Vojna? 4. Albanski politicari koj barat imeto na Makedonija da se smeni, mnogu makedonci go tolkuvat kako Albanski rasizam kon makedonci. Sto e tvojata reakcija? 5. Hipoteticki, dali bi reagiral ako etnicki Grk politicar vo Albania pobaral imeto na Albanija da se smeni? 1. 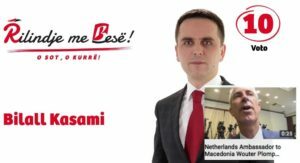 Does Besa receive assistance from the Netherlands Embassy in Macedonia? 2. Does Besa receive any financial donations from the Netherlands – either from state institutions or private NGOs (Non Government Organisations)? 3. Will Besa seek to remove the statue in Simnica of Xhem Hasa, the Albanian Nazi and collaborator with Hitler’s Germany during World War II? 4. Albanian politicians who seek to change Macedonia’s name are regarded by many Macedonians as being Albanian racism towards Macedonians. What is you reaction to that? 5. Hypothetically if an ethnic Greek politician in Albania campaigned to change Albania’s name would you react?